I asked her team.up with me on a little project...since I am not so good in the kitchen/ DIY area and she is AMA.ZING....(not only does she create incredible things but her presentation is BEAUTIFUL), I have asked her to help me out in these areas! Hooray! She is truly an inspiration with all of her creativity...it makes my heart skip! So today she is bringing you this fabulous recipe! I mentioned this weekend that I made my husband and cake for his birthday. He loves chocolate but I didn't really want to make a just a boring chocolate cake so I made a quick version of a recipe my grandma made for my family when I was younger. She used to make Black Forest Cake for my brother because it was his favorite. 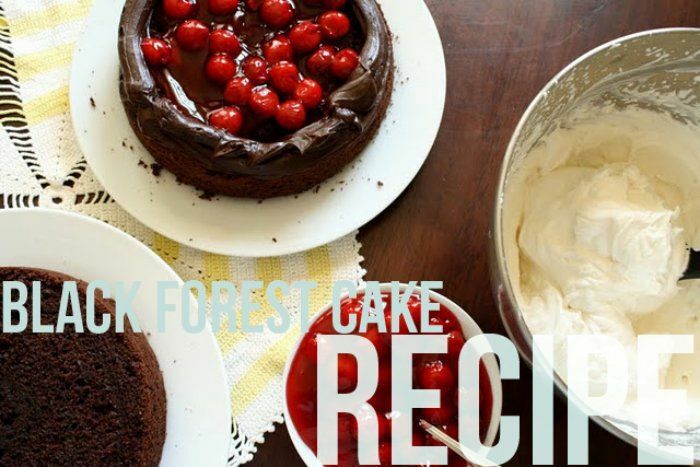 So here's a quick way to make it and I've also shared a link on how to make your own Black Forest Cherry filling to make it more authentic (if you have more time than I did). Preheat oven to 350 degrees. In a bowl, stir together the sugar, flour, cocoa, baking powder, baking soda and salt. Add the eggs, milk, oil and vanilla, mix for 2 minutes on the low to medium speed of mixer. Stir in the boiling water. (for cupcakes) Bake 19-21 minutes. For your cake (9 inch rounds) bake about 35 minutes. Whip your heavy cream (in a cold bowl) until it stiffens and peaks. Add in your powdered sugar and vanilla. Don't over beat your whipping cream because it will thicken and get butter like. (not so good). I used a cherry pie filling from a can but here is a great recipe for cherry filling from scratch found here. For cupcakes: use a small fork to dig out the centers of your cupcakes and fill with your cherry filling (and a little chocolate ganache if you would like). Ice with fresh whip cream. I also topped them off with left over cherry filling.